If you’re a fan of old-school horror movies, then you know that the names of sequels to the original followed a specific progression, rather than the current trend of slapping a Roman numeral after the original title. That explains the title of this post, the sequel to The Return of Dr. Dreadful, which is turn was the follow-up to a post about the Dr. Dreadful line of food toys. As promised by the original Dr. Dreadful – inventor Robert Knetzger – the new and imported Dr. Dreadful line appeared in stores last month. She Who Must Be Obeyed found two of them on the shelves at Target, and brought them home for me to play with. If you compare the box I opened (seen at the top of this post) with the prototype shown in the original post, you’ll notice a few differences, the most significant being the change from “Dr. 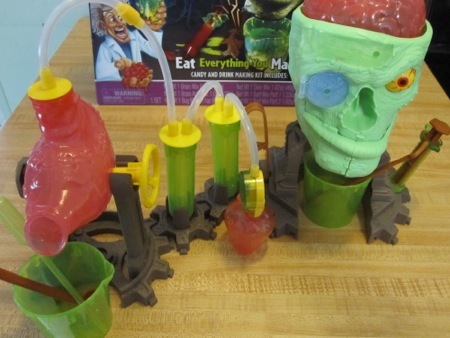 Dreadful Zombie Drink Lab” to “Dr. Dreadful Zombies Zombie Lab.” Zombies are the hip monster these days, all the kids love zombies – or so the marketers must suppose. The other change is the inclusion of photos of actual kinds sampling the output of the lab: three boys – one a person of color – but why no photo of a girl? Believe me, there are guys out there who would think playing with a zombie drink lab as a tween was a desirable trait in a potential romantic interest. At least I would. He Who Will Not Be Ignored and I assembled the two kits, which are designed to be linked together. The two missing kits – Bug Lab and Snot Shots – seemed designed to do just one thing, as did the Stomach Churner we hooked up to the main Zombie Lab. We experimented with the Stomach Churner first, following the instructions to make a foaming drink. Employing my best Colin Clive accent, I urged my assistant to mix blue and yellow liquids and pour them into the test tubes. 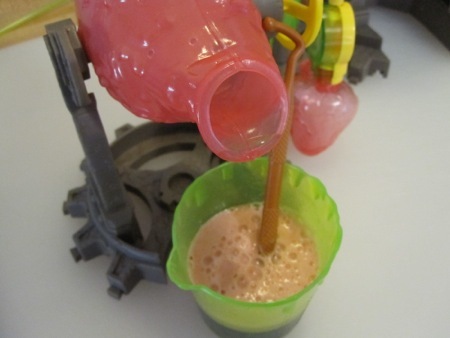 The beaker was filled with a third mixture, then the heart-shaped pump was squeezed until the contents of the test tubes had traveled trough the attached clear tubing, where it mixed in the plastic stomach. When filled, the stomach tilted forward and deposited its contents into the beaker, where it formed a fizzy red liquid that could best be described as “berry’ flavored. It wasn’t very foamy, probably due to the obvious moisture-soaked state of the supposedly dry ingredients. The original Food Lab powders were packaged in plastic-lined paper envelopes, but the new versions are supplied in thin clear plastic bags, which might not have been properly sealed. 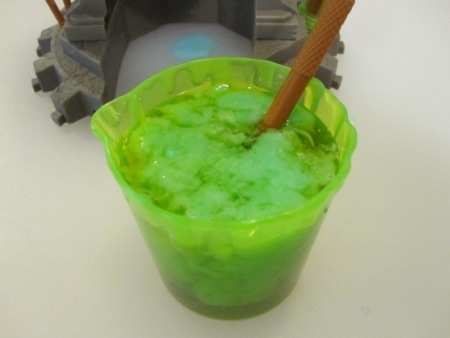 Next up was making “zombie barf,” which involved pouring a solution of Mix 1 into the brain-shaped container and resting it in the skull, then adding Mix 2 to the receiving beaker. When He Who pressed down on the brain, a valve opened, the skull’s jaws swung open, and we watched a gush of blue goo fall into the beaker. 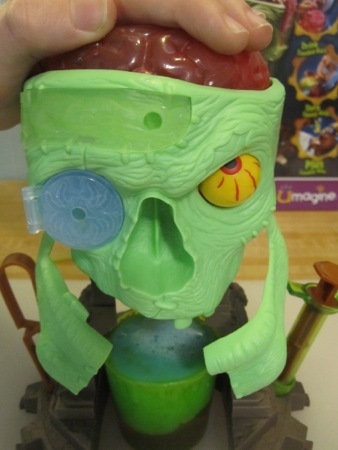 If you look closely at the skull apparatus, you’ll notice a syringe to the right and two molds where the left eye socket and eyebrow ridge should be. I mixed up some of the “bug formula” and injected it through the two holes (thinking of Un Chien Andalou as I applied the syringe to the eyeball). The filled molds, when allowed to set in the fridge for ten minutes, discharged a cherry-flavored gummy worm and spider. For this technique, timing is crucial: you have to let the gelatin mix set enough to be viscous but still injectable, otherwise it leaks all over the front of the skull, as I quickly discovered. This entry was posted in food & cooking and tagged food. Bookmark the permalink.